Finally completed the interior. Three sliding trays and saw storage on the lid. 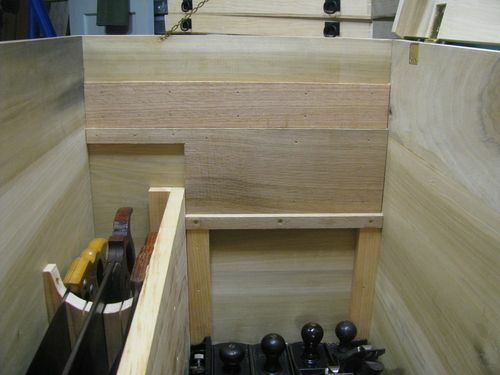 Tray bottoms are white oak shiplapped and pine sides The drawer slips are red or white oak (whatever was available). I used cut nails for their holding power. They were a bugger to get out when I had to redo one bottom so I figure the bottoms are good for some time. The ring pulls are shutter pulls from a local blacksmith. I had a bit of a disaster soon after filling the chest, a gutter failed and emptied into the window well in my shop. Just my luck we had almost 4 ” of rain! 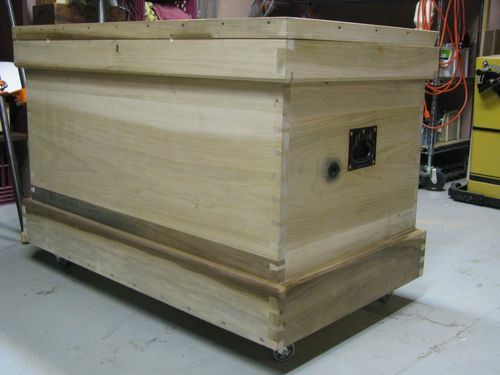 While the chest is on wheels and did not get wet, the dry wood soaked up a lot of moisture from the air and rusted the bottom and some sides of EVERY plane. Spent a week cleaning and lapping soles. Did I mention that the dehumidifier quit at the same time, motor ran but did not pull out any moisture. I bought some Zerust liner material from Lee Valley and lined all the trays as well as the bottom of the saw till. 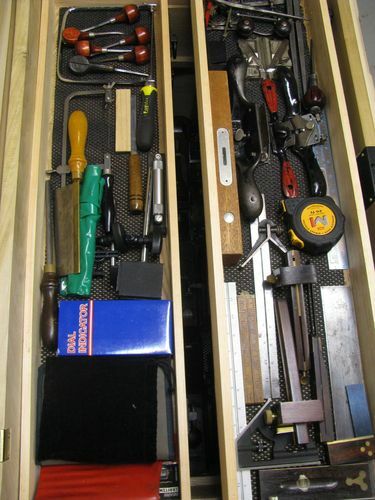 I also wipe all the tools with camelia oil before putting them back. The handles are from a disintegrating flea market tool chest I got for five bucks. Made a template to rout the handle portion and used a 71 hand router to flush mount the handle plate. I’m still undecided on a finish for the exterior. Possibly water or alcohol based dye, or maybe a thinned milk paint.I’m just a beginner and I spent a LOT of time on the dovetails and carcass fitting so I want the joinery to show. Sorry to hear about the flood… been through that before, painful! 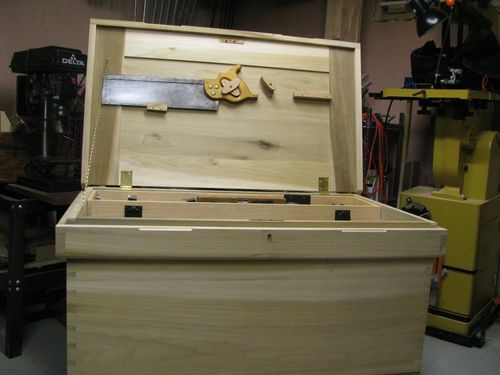 Excellent job on the chest, I really like the side handles and the poplar. 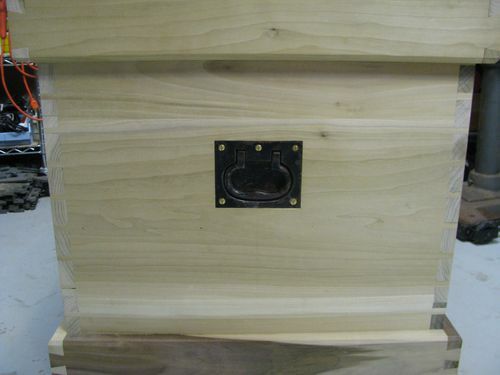 ...from the joinery to the protective storage, great attention to detail. Very nicely done, OldFart! What lockset did you use? Your keyhole sits high / closer to the top edge than most I’ve seen. And that’s something I’m looking for. Thanks for posting! Thanks for the comments, Smitty the lockset is from Lee Valley item # 00P36.35, and RB there is no way in H…. that this thing is leaving my cellar full. It is 100 + pounds empty and I’m guessing its roughly 250 lbs full ! OF, thanks! 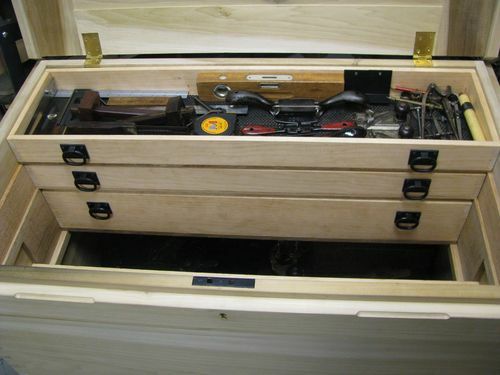 I’ll check it out for my tool chest! I’m considering doing mine with a slightly lower wall on the saw till so that the bottom sliding till could slide all the way to the front. Does this sound like a worthwhile modification? I figured it would be easier to see the contents of the tills if they were arrayed withh the bottom one in front. Or does it work just as well with the lower till at the back? I kept the saw till wall at its original plan height to accommodate storing saw sharpening stuff underneath the saws. I’ve not had much difficulty in seeing the tray contents as I can push the bottom tray back against the wall and pull the two top trays forward. The only change I would make is in the height of the lid. Another inch higher and I would have more room for my try squares and the like. BTW outstanding job on the saw vise. Thanks for the answer. Bummer about the rust because I thought one of the main benefits of wood over a metal tool chest was the ability to protect stuff from moisture. I suppose a coat of paint will provide a moisture barrier but it would probably make sense to paint the underside of the chest as well. It looks really impressive loaded up with tools. I can’t wait to get going on mine. I should of come here earlier. I will also have to add the rubber matt to mine when I am done. 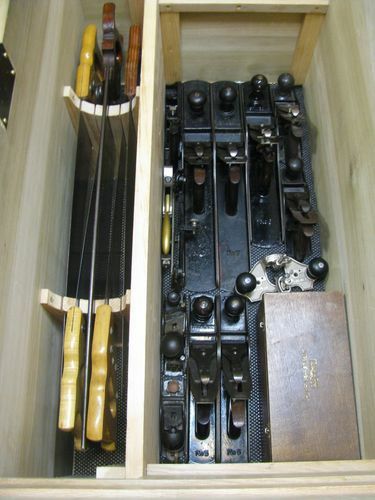 I imagine that would offer a great deal of protection to the tools and the wood.